Several months ago, I received a call from Tim Newman in Austin, a local baseball historian with an interest in the early Texas League. Tim was hoping I had some information on Gene Burns, a pitcher he had found played for Paris in 1902. I had no record of Burns having played in Paris; however, William Ruggles, long-time Texas League statistician, did note him as appearing with the team. So, I did a little more investigation. As it turns out, if Gene Burns did play with Paris in 1902, it was for a very brief period and he was never listed in a box score. He did, however, play in the Texas League in future years. He appeared briefly with Fort Worth in 1902, followed by a stint with Houston in 1903. His best year came in 1904, though. While shuffling around the league, Burns posted a 24-9 won-loss record. He returned to Galveston in 1905, finally ending his career with Waco the following season. Complete statistics for Gene Burns are as scarce as information about the man himself. He did, however, pitch the first no-hitter in the history of the short-lived South Texas League. Statistics and achievements on the field are interesting, at least to baseball historians, but Gene Burns is also a great example of what goes into the hunt for a long-forgotten personality who left little hint as to his life and what eventually became of him. As is often the case, a tiny nugget of information buried in the page of an old newspaper printed in tiny typeface provided the break in solving the case of Eugene Burns. In early 20th century newspapers, ballplayers are only occasional listed with both their first and last names. At most, one will find a first and middle initial with a last name or sometimes just a nickname. This makes tracking down old Texas Leaguers extremely difficult, especially when a name as common as “Burns” is the subject of the search. After scouring the internet and newspaper archives, though, I finally hit pay dirt with an issue of The Galveston News in 1904. Most of the season the newspaper had included statistics on a player named “Burns,” but buried within a one paragraph article on the sports page I found gold. Gene Burns, the paper noted, worked in the off-season as a wholesale grocer in Fort Worth. With that bit of information, Burns’ life came into focus. Eugene Frank Burns was born August 6, 1882, in Kansas. Unfortunately, his date of birth makes it difficult to track his heritage. He obviously would not be listed in the 1880 census records, and by 1900, he apparently had left home. The secret to his parents would like be held in the 1890 census, but those records were lost long ago in a fire. Even though we can’t tell where Burns came from, there is a wealth of information on what he did over the course of his baseball career and life. In 1907, Gene married Effie E. Burns, a native Texan whose mother also hailed from Texas and her father from Arkansas. The following year, Effie gave birth to the couple’s only child, Eugene Arthur Burns (the small family another difficulty in finding information). The family resided in Fort Worth, where during the off-season, Gene Burns worked in the grocery business for a period spanning at least 35 years. By 1942, he had gone to work for the Texas Ice and Refrigeration Company also based in Fort Worth. Following his baseball career, Burns remained involved in the sport on an amateur level, serving as an umpire in Fort Worth. But his focus remained on the grocery business that earned a good living for his family. By 1940, young Eugene had moved to Arizona where he became a rancher until World War II, when he enlisted in the Marines and served as a sergeant. Eugene Burns died in Dallas on June 23, 1963 of a heart attack while battling colon cancer and high blood pressure. Effie went to work for Contact electronics following his death. She died April 6, 1979, and is buried beside her husband at Grove Hill Memorial Park in Dallas. Interestingly, the couple’s son died in 1972, just nine years after his father. He, too, died while undergoing treatment for colon cancer. So, there’s an inside look into what it takes to track down a long-lost ballplayer who perhaps only Tim Newman of Austin was aware existed. Thank you, Tim, for offering the challenge. The hunt is the most entertaining part of the chase. In the early 20th century, baseball players were anything but role models mothers wanted their children to idolize. Mothers regarded them as a rough-and-tumble bunch; men who would rather play a senseless game than work for a living. With a ballgame played in two hours at most, baseball players had a lot of spare time on their hands. Any mother knew idleness led to trouble when youngsters were involved. And even today, in a mother’s eyes, does a child ever really grow up? The only thing many mothers of a hundred years ago despised more than baseball itself was the idea of playing the game on Sunday. In many cases, local laws supported them. Blue laws prohibited many Sunday activities, particularly if they involved providing entertainment for profit. Remnants of blue laws still exist. In Texas, liquor stores and auto dealerships are closed on Sundays. A hundred years ago, baseball became the center of the blue law controversy. As the Texas League gained popularity, pressure increased for laws to be changed to allow baseball seven days a week. A professional franchise sitting idly for just a day could hardly turn a profit. A day gameless meant the loss of the usual $50 guarantee for the visiting team. Still, owners were left with daily expenses and travel costs, and that one game may have meant the difference a team continuing play or dropping out of the league. More than one owner or manager found ways of working around the blue laws. In putting together its circuit, a meeting held at least annually, Texas League stalwarts like J.M. Gardner, William Ward, and Doak Roberts would dominate discussions and rail against awarding franchises to communities with prohibitions on Sunday baseball. and occasionally a team, was detained for breaking Other owners and managers simply chose to ignore the law, and in most cases the constable simply turned his head. But on occasion, a manager and sometimes even an entire team found itself in jail rather than at the ballpark. Normally, all involved were quickly bailed out of jail by enraged spectators who had paid their nickels to see nine innings of baseball. By the 1920s, many communities relaxed their prohibition on Sunday activities. Mothers, on the other hand had never been early-adopters when it came to change. The only law that really mattered to a kid with a ball, a bat, and a mitt was the one a mother enforced. Violations were often followed by trips to the woodshed. So it was. For many years, mothers did their best to protect their sons from the game’s inherent and detrimental sins. Some even continued to attempt to influence their sons’ choices long after they had reached adulthood. My great-grandmother, Mary Phillips Rutherford of Petty, Texas, was not an exception. By the latter half of the 1920s, Mary and her husband Jack had raised a family of seven children—five sons and two daughters—with four of the boys and one girl having survived the dangers of infant mortality. Of the four surviving boys, at least three had an interest in baseball, led by the oldest, Frank, born in 1906. Frank was a member of the Petty “Nine,” the local town ball team that played teams from nearby communities on a regular basis. In fact, between Frank, his brothers, and their cousins from up the road, the Bevilles, Petty almost had a complete team. The Beville family fielded a fine bunch of ball players itself, led by all-around athlete Elvis and his brother Joe, who became a much sought after pitcher and had tryouts with Oklahoma City of the Texas League and Knoxville of the Southern Association. Ultimately, he played only briefly with Knoxville’s East Texas League affiliate, Tyler, before he decided professional baseball was not for him. Frank became Petty’s team leader and was well-known on the town ball circuit in Lamar and Fannin Counties. Much to his mother’s chagrin, even after marrying Lorene Dellinger in 1926, Frank continued to play ball when he wasn’t working on the family farm. And Sundays, as always, were certainly no time to be working! One summer Sunday in the latter half of the 1920s, Frank and his Petty teammates hopped aboard the Texas and Pacific Railroad headed for Paris, where they would challenge a team from the Lamar County seat. Despite a much smaller pool of talent to choose from, the Rutherford- and Beville-led Petty squad was formidable. With Petty in command on the scoreboard, Frank stood at the plate in the middle innings. Never a shy hitter, he swung at the first pitch and wrapped it past the third baseman into left field. Knowing his team had a substantial lead, Frank tried to stretch his base hit into a double. He didn’t hesitate as he rounded first base. But Paris’ outfielder hustled to the ball, and Frank could see his two-sacker wasn’t a given. Frank, the second baseman, and the ball all arrived at the bag together, and an unintentional but violent collision ensued. Years later, Roscoe Jones, either a player or a spectator sitting in the bleachers, noted that out of the dust, he heard what sounded like a shotgun. Frank lay on the ground trying to make sense of the loud crack Roscoe had heard as well as the jarring pain shooting from his lower leg. It wasn’t long before everyone realized Frank had likely fractured or broken some bones, and he was driven to the Paris Sanitarium for treatment. Family members do not necessarily agree on the name of the doctor treating Frank that afternoon, and there is a question as to whether the physician may have been less than sober when Frank arrived. In order to protect the innocent, we’ll simply note that the doctor confirmed a break in Frank’s lower leg, but he noted it was nothing too severe. Surgery was unnecessary; the doctor merely aligned the bones and applied a cast to Frank’s leg. Believing his patient to be in suitable condition, the doctor announced he would be leaving town for a few days but would return on Friday to see how Frank had progressed. In the meantime, he assigned a far less experienced intern to watch over Frank in his absence. Long before the 20th century, physicians knew that bones carried blood vessels and were prone to bleed when broken. In response, the tissue around a broken bone can be expected to swell. The swelling may appear immediately, or it can take up to five days to be noticeable. Perhaps Frank Rutherford’s doctor did not believe his leg to be broken so severely that swelling would become an issue; yet, soon after the doctor left the hospital, Frank began to experience extreme discomfort beneath his cast. He repeatedly begged the intern to loosen the wrapping and allow his leg to breathe. But the intern told Frank he was not authorized to alter the cast in any way. Frank continued to writhe in pain, but it lessened as the week went along. As promised, the doctor returned by the end of the week and cut open the cast to see how well Frank’s leg had healed in the first few days. Upon seeing Frank’s blackened limb, he immediately took him to surgery. The cast had, in fact, been set too tightly to allow for swelling, and the circulation of blood to Frank’s leg had stopped. It wasn’t long before the surgical team realized that gangrene had set in. Frank’s lower leg was “dead,” and amputation was necessary. They could only hope the infection had not entered his bloodstream and spread to other parts of his body. Many who lose limbs enter into stages of grief, including anger and depression. Frank, on the other hand, took the news in stride. When Lorene asked Frank what he expected to do, he simply responded, “Well, I guess I’ll have to work with my head instead of my feet.” In short order, he did just that. In the coming years, Frank Rutherford worked as a clerk and managed a cotton gin. When Greenville’s Monty Stratton, a major league pitcher for the Chicago White Sox, lost his leg in a hunting accident in 1938, Frank could do more than simply empathize, and Stratton’s attempt to continue playing on a prosthetic leg inspired him. As he heard of people in the area who lost limbs in farming accidents or of World War II veterans returning home to adjust to life with a disability, Frank made the rounds, speaking with many and explaining that dreams don’t ever die, they just change. He became a self-appointed ambassador for those with disabilities, although no one who ever met him would say Frank had the slightest feeling he had been disabled himself. After all, he had been hurt playing a game. Others with similar injuries had been providing for their families or fighting foreign enemies. Frank felt himself to be fortunate. After all, he was able to work and raise a family, something so many others he met could no longer expect. Over the years, Frank Rutherford continued to use his head rather than his feet, eventually opening what was essentially an early “convenience store” in Petty, selling groceries and gasoline just a few steps from his house. He continued to operate the store into the late 1970s before retiring. When I visited my great-Uncle Frank during the ‘70s and early ‘80s, I was mesmerized by his wooden leg and the oval hole I could stick my finger inside. He warned me his leg was home to a family of mice, and he couldn’t guarantee I wouldn’t be bitten; yet, I somehow remained unscathed. Uncle Frank’s leg did not fail to create its difficulties. His daughter JoAnn, my father’s first cousin, tells of lying in bed with the artificial limb that had essentially become a detachable part of Frank’s existence. She recalls being overcome by the smell of alcohol on heavy wool socks he used to clean the stub of a leg left below his knee. In fact, when she mentioned the smell in a recent email, my senses quickly came alive. I was reminded of the time when, without malice, I kicked Uncle Frank’s wooden leg, knowing he had the one shin I could kick without fearing retaliation. Little did I know that the stub happened to infected at the time, and he found my playful kick quite painful. Uncle Frank was not pleased, and I’ve never kicked another leg since. Despite what baseball took from him, Frank never lost his love of the game. By about 1975, I had become a baseball fanatic, and on weekend visits to Uncle Frank’s house, I was often greeted by Vin Scully and the NBC Game of the Week on television. I also recall summer evenings sitting on the couch next to Frank’s chair as we struggled to filter the conversation around us and listen to the Texas Rangers broadcast on WBAP out of Dallas. We kept abreast of what the likes of Toby Harrah, Fergie Jenkins, and my personal favorite, Juan Beniquez. All accomplished a lot at much-maligned Arlington Stadium, despite the fact those Rangers teams had normally fallen so deeply in the standings by mid-June that all hope was lost for the long summer ahead. Unfortunately, Uncle Frank didn’t leave me with the litany of baseball knowledge I seek today, but his promising, yet all-too-short, baseball career did leave me with one lasting lesson. When Momma says don’t play on Sundays, chances are she’s right. Between 1896 and 1957, Lamar County claimed thirty-three professional baseball teams as its own. Paris, of course, was the center of baseball activity, and the city sported franchises in eleven different leagues ranging from the Class B Big State League in the late ‘40s and early ‘50s all the way down to the unclassified and short-lived Southwestern League in 1898. Over the years, hundreds of players passed through Paris either on their way to great baseball accomplishments or just for a brief respite from their regular jobs working the fields. Of all those players, only one, seemingly with no attachment to Lamar County, returned time and time again. Earl Elmer “Red” Snapp was born in Stephenville in December of 1888, the second son of Hezekiah and Alice Snapp, who had arrived in Texas from Virginia three years earlier. The elder Snapp ran a blacksmith shop in Stephenville, while his wife tended to the couple’s boys, Carl and Earl. By 1908, Earl had left home and traveled 70 miles northeast to Fort Worth, where he attended Texas Christian University and played on the baseball squad. After two years of college, Earl decided it was time to take the plunge into the professional ranks, signing with the Texas Leagues’ Fort Worth Panthers. After three woeful Texas League seasons during which he batted just .226, he left Texas in 1913 and served as player-manager for three teams in Kansas and Nebraska. A year later, though, he returned to Texas, signing with the Paris Boosters of the Texas-Oklahoma League. Earl helped his team to a first place finish, although they lost to Texarkana in the playoffs. In 1915, Red Snapp moved from the ranks of a player and part-time manager into a full-fledged baseball executive, with duties both on and off-the-field. He brought the Western Association to Paris, and served as owner, secretary, player, and manager of the Paris Red Snappers, the first of many teams bearing his name. The 1915 Snappers finished fifth in the eight team league, with a 66-66 record. In 1916, following the Paris fire on March 21, he briefly left the city to play and manage with the Oklahoma City Senators, but when Paris recovered and fielded a team again, he returned and finished the season as manager of the “Survivors,” a team finishing in last place, thirty-two games behind Denison. Clearly a far better manager than player, after the 1916 season, Red Snapp retired from baseball, and for the next several years remained in Paris, a shoe salesman for Conway and Short, Inc. on the west side of the plaza. In the meantime, he married and lived on Pine Bluff Street, just a few blocks from Paris’ ballpark. Red and his wife, Maud, soon had two daughters, Elizabeth and Marynel. By late 1920, baseball once again called, and the Oklahoma City Indians attempted to lure Red out of retirement to manage its Western League franchise. The following season, Snapp did return to baseball, but not in Oklahoma City. Instead, he organized his own franchise in Paris, the Snappers, in the Texas-Oklahoma League. It was here he entered his best years in baseball, as the Snappers took the pennant with an 89-38 record. In the championship series, they faced Ardmore, and with the series tied at four games and scheduled to resume in Paris, Ardmore refused to play. By default, Paris claimed the championship. The Snappers repeated in 1922, posting a 72-36 record before taking the championship series from Greenville in five games. Outfielders Chink Taylor and Joe Bratcher led the Snappers along with pitcher Sam Gray, all future major leaguers. In 1923, Red Snapp took his team to Ardmore of the Western Association, a Class C League, one step up from Paris. Again, the Snappers claimed the League title, giving Snapp three consecutive championships. For Paris’ part, the city went on to field a team, the Grays, in the East Texas League, and grabbed a third straight title. After a last place finish in 1924, Paris again claimed the championship a year later, while Red Snapp managed Okmulgee of the Western Association. In 1926, he returned to the East Texas League, managing both the Marshall Snappers and Paris Bearcats for parts of the season. In 1927, he spent his last season in Paris and led his Snappers to a fifth place finish in the Lone Star League. By 1928, with years of minor league experience under his belt, Earl Snapp decided to plunge into League management and formed the West Texas League. He placed his own team in San Angelo and claimed another pennant over the likes of Abilene, Midland, and others. After just one season, he left his brainchild and returned to the Lone Star League, managing the Sherman Snappers for only three weeks before the League disbanded. Without Snapp’s enthusiastic leadership, the West Texas League lasted only one season. Over the course of Red Snapp’s ten years as a manager, he led his teams to five championships, including two in Paris, the first championship clubs the city ever fielded. He also became known as a prime developer of baseball talent over the course of his career, with nearly two dozen future major leaguers learning their craft under Snapp’s guidance. In a 1928 profile in The Sporting News, Snapp was recognized as the “King of the Minor Leagues” in Texas, noting him as a one-man board of directors who had experienced success everywhere he went. After baseball, Snapp settled with his wife and two daughters in Dallas. For forty-five years, he owned and operated Red Snapp’s Service Station at Cadiz and Marilla Streets in the downtown Dallas just a few blocks east of today’s convention center. He passed away January 3, 1974 at the age of 85. “Where I go, pennants go,” he told TSN in 1928. Based on his record, Red Snapp’s confident statement was not merely a case of bragging. Few mistook the 1897 Paris Midlands for a quality baseball club. Though backed by the deep pockets of Edward Howland Robinson Green, among America’s richest citizens, the Midlands just didn’t have the lineup to compete with the rest of the Texas League. Finishing the first half of the season buried in last place with a 21-49 record, few had great expectations for the second half, set to begin on June 29 at Dallas. Still, the entire purpose of a split season was to provide hope for baseball kranks of the “tail-enders.” Despite their miserable first-half performance, when the Midlands and Colts met at Fairgrounds Park, all eight Texas League teams entered the day on equal footing. Considering Dallas finished the first half just in one place ahead of Paris, Midlands fans held out hope the three game series might get their team off to a hot start. Many North Texas farmers feared a coming drought for the summer of 1897, but June 29 dawned with hopes of rain. A southerly wind drove the temperature to the mid-90s by mid-afternoon, but storm clouds could be seen forming southwest of Dallas. Still, there was a ballgame to be played, and at 4 o’clock umpire Mackey signaled for the first pitch. The Midlands sent staff ace Charles “Daddy” Nolan to the mound. Nolan, described as a “fine little twirler” by the Galveston Daily News, came into the game with a poor win-loss record but a fine earned run average, his lack of success in the win column mainly the result of the Midlands miserable offense. In fact, just a few weeks earlier, Nolan had struck out 11 Austin Senators batters, a season-high for Texas League pitchers. He seemed just the pitcher to punch the Midlands ticket to a successful second half. Paris batters stuck to their usual form that afternoon, notching just three hits and no runs over the first four innings. Charles Nolan while pitching relatively well, found a porous defense behind him. Despite surrendering just six hits on the day, the Midlands defense committed 11 errors over its five innings in the field, giving Dallas 11 runs on the day, only three charged to Nolan. First baseman George Nie, normally among Paris’ most dependable fielders, led the Midlands in errors that afternoon, but the true story of the game isn’t found in the box score. In 1897, unlike today, the home team batted first. A full five innings had to be played for a game to be considered official. On June 29 in Dallas, the Paris Midlands found themselves down 8-0 after just two innings, and chances of a comeback appeared bleak. Dallas catcher James “Tub” Welch, just a .238 hitter on the season, slammed what the Dallas Morning News claimed as the longest home run ever at Fairgrounds Park in the first inning, and young third baseman Hoover registered a bases-clearing triple. By the top of the fifth inning, as storm clouds settled over Fairgrounds Park, the Midlands realized their best chance to call the afternoon a success would be to insure a rainout before the last inning could be completed. When the Midlands took the field to lead-off the inning, they did everything possible to delay the game. The usual fast pace of late 19th century baseball slowed to a crawl as Nolan took his time between pitches, lobbed balls half-heartedly over the plate to eager Dallas hitters, and assisted his defense in committing a number of fielding errors even a schoolboy would have turned into outs. With two outs and the skies about to burst, former Midland Warren Beckwith reached base on George Nie’s fourth error of the game, and immediately attempted to steal second by walking to second in hopes of making the inning’s final out. As Nolan made no attempt to toss the ball to second baseman Elmo Jacobs, Beckwith continued his walk to third, passing William Peeples who stood with his hands on his hips. Finally, as Beckwith approached home plate, Nolan offered a veiled attempt to record the out, throwing the ball fall over catcher Dan Boland’s head and allowing Beckwith an easy run. By this point, the umpire caught onto Paris’ scheme and warned team managers Dan Boland and Bobby Burns to play ball or face a forfeit. Whether the managers relayed the order to their team is unknown, but Charles Nolan attempted to slowly offer the next batter a base on balls, pitching wildly outside the strike zone. The Dallas batter, now onto the Midlands plan as well, swung at all three pitches, and registered the final out, seemingly forcing Paris into a final at bat. As the Midlands strolled off the field, the skies opened and sheets of rain swept across the ballpark. Clearly a regulation game would not be played that afternoon, and the Midlands began to look forward to replaying the game from its start the following day, an unblemished 0-0 record still intact. Unfortunately for Paris, umpires of the day had great leeway in applying the rules as they saw fit. As the rain turned into a torrent, Umpire Mackey declared the game official, with Paris forfeiting by an official score of 9-0. Dan Boland put up a feeble protest, but the umpire’s decision stood. By intentionally delaying play, Paris had manufactured an unofficial game, but Mackey refused to back down. Paris went on to not only lose that game, but six of its first seven to open the season’s second-half. Clearly, the split season would offer the Midlands no chance at redemption. The results in Dallas did little to dissuade Paris from attempting to take advantage of what they believed was a loophole in the league rules related to official games. Under similar circumstances just over a month later in Galveston, the Midlands attempted the same strategy, this time as a means to a different end. Although they had little chance of making a run at the second-half title, in Galveston the Midlands were far more interested in getting out of town with the $50 guarantee paid to any visiting team playing an official game. Ranking as the worst drawing card for any team in the league, Paris made far more money on the road than at home, and other Texas League owners dreaded their arrival, knowing the crowd would not pay to watch an uncompetitive game. In fact, in most cases, owners hosting the Midlands were lucky to earn any profit after paying the guarantee. But, the inconvenience didn’t deter the Midlands. Undoubtedly, E.H.R. Green had grown tired of losing money in baseball and ordered team management to avoid financial losses at all costs. With the team scheduled to spend another night in Galveston before catching a train out to San Antonio the next morning, Boland and Burns realized a shortened game would allow for an overnight train ride, saving hotel costs. So, as Paris quickly fell behind the Sand Crabs, the managers looked to the skies and realized a short game would be to their boss’s financial advantage. As the Midlands put up little effort on defense in hopes the rain would soon begin, the umpire, apparently warned in advance of Paris’ tactics, immediately forfeited the game to Galveston. Mission accomplished. E.H.R. Green saved twenty dollars, and Galveston gleefully accepted the unearned victory as they fought for the league championship. Limping into San Antonio early the next morning, the weary Midlands put up little fight against the Bronchos a few hours later and played with even less heart over the last 20 games of the season, which they finished with a 5-15 record. The Midlands combined 41 wins in both halves of 1897 left Paris as the cellar dweller in the overall standings, 34-1/2 games behind the champion Sand Crabs, and nearly ten games behind 7th place Dallas. His endeavor into professional baseball a financial disaster and personal embarrassment, E.H.R. Green moved on to more lucrative pursuits the following year. He quickly built the Texas Midland Railroad, for whom he had named his baseball franchise, into a Texas empire linking the remote northeastern counties to Dallas-Fort Worth and South Texas. Undoubtedly the hotel costs he saved that afternoon in Galveston contributed greatly to his success. C.W. Eisenfelder: Cold, Calculating Capitalist or Bumbling Baseball Executive? The Paris News’ A.W. Neville’s recalled Charles W. Eisenfelder, 1902’s Paris Texas League team owner, as a “tall, gangly, and loose-jointed” man. After researching the elusive Eisenfelder over the past several years, I wonder if Neville directed his words less at Charles’ physical appearance than his eccentric and unpredictable behavior. A native German immigrating to the United States his mother in 1867, in Galveston four-year old C.W. Eisenfelder seemed to begin a lifetime searching for his niche. Fancying himself an entrepreneur of sorts, Eisenfelder took an interest in sports and recreation as he grew older, and he became well-known, if not infamous, in the Galveston community. But, the sparse written records of Charles’ ventures reveal a man holding at least a touch of an inferiority complex and desperate to leave a lasting mark in Galveston’s crowded business and political circles. When Charles came of age in the late 1870s, he worked in a grocery store to support his mother. At the time, three families controlled Galveston. The Moody’s dominated Galveston’s cotton trade and diversified into a number of endeavors, most notably banking and insurance. The Kempner’s made their fortune in the mercantile and banking industries, and the Sealy family involved itself in everything from the railroad to cotton to twine. Most notably, though, the Sealy’s essentially held a monopoly on Galveston’s wharf area, a highly lucrative venture in a city many considered the most important port on the Gulf Coast. Records suggest Eisenfelder resented the power the three families held over the island, and the ambitious young man slowly developed plans to do something about it. In the meantime, though, Charles entered the business community himself, hoping he might become the patriarch of Galveston’s fourth influential family. As the years passed and Galveston’s harbor activity spurned Texas’ rapid growth, Eisenfelder garnered attention on a number of levels. His first reported business venture, the purchase of an already failing Galveston saloon in 1885, lasted only briefly. Less than three years later, Charles had set up shop as a book dealer and married fellow German immigrant Paulina Friedrich. After all, any gentleman expecting to become one of Galveston’s elite required a wife to make inroads in social circles. A year later the Jewish born Eisenfelder became a leader in Galveston’s Spiritualist Church. Perhaps not so much a coincidence, William L. Moody’s wife Libbie also attended the church as a faithful supporter. After spending several years as a clerk with the C.G. Fordtran feed store, in late 1894 Eisenfelder bought out his employer and entered the feed and grain business on a full-time basis. Undoubtedly Eisenfelder expected his new business situated in the heart of the Galveston’s famed Strand business district would propel him to a higher standing in the community. And, it most assuredly did. The eccentric businessman made major news when he sued the Galveston fire department for its slow response to a fire destroying his inventory. The City soon returned the favor and sued Eisenfelder himself for refusing to pay his business occupancy tax, and a long-running feud between local government and Eisenfelder began. Charles had made a name for himself, but even he would have admitted his dreams weren’t progressing as planned. By the late 1800’s, his feed and grain business a success, the ambitious but somewhat misguided Charles Eisenfelder entered the sporting world as a part-time boxing promoter. Although he became involved in the boxing just as Galveston native Jack Johnson began a climb toward worldwide fame as the eventual first black World Heavyweight Champion, it is doubtful Eisenfelder had any involvement in Johnson’s career. But, the sporting bug bit Charles like a starving chigger, and he looked to expand his sports venture into professional baseball. 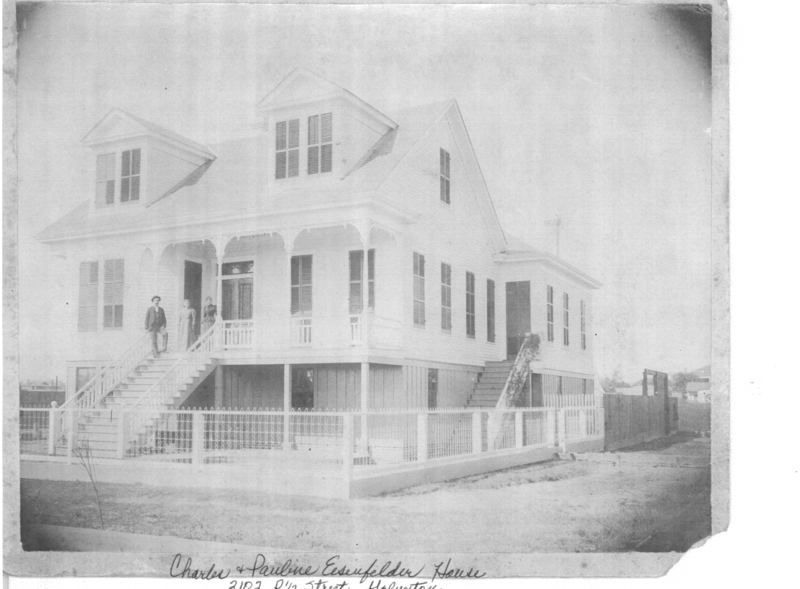 If Charles Eisenfelder hadn’t become well-known in Galveston through his business dealings and as a boxing promoter, in 1899 he gained notoriety as part owner the Galveston Sand Crabs baseball team. The Texas League as a whole had ceased operations eleven games into the 1898 season with the onset of the Spanish American War. A year later, the North Texas teams failed to regroup, but the South Texas cities of Galveston, Houston, San Antonio, and Austin organized a circuit of their own known as the Texas Association, and the Sand Crabs dominated play. With Paris native Ben Shelton making his professional debut, Galveston took both halves of the season by sizable margins and claimed the league championship. The following year, though, both North and South Texas baseball lay dormant, as the professional game went on a two-year hiatus in the state. In the meantime, Eisenfelder returned to managing his business on the Strand. Despite Charles and Paulina Eisenfelder’s home on Ave P-1/2 resting in the middle of the 1900 Great Storm’s zone of total destruction, somehow both the couple and their house survived. Apparently, the same could not be said for the C.W. Eisenfelder Company warehouse on The Strand, however. Though destruction on the bay side of the island didn’t come close to that experienced several blocks eastward toward the Gulf of Mexico, flooding waters engulfed the business district, and Eisenfelder soon discovered his inventory destroyed. By 1901, the C.W. Eisenfelder Company no longer existed. Charles remained undeterred, though, and made lemonade out of the storm responsible for the deaths of 6,000 fellow Islanders as he pursued a career as a full-time baseball executive. With Galveston still recovering from the storm and in no mood for baseball, in early 1902 he looked to North Texas and its reorganized Texas League for a franchise. For the bottom dollar price of $250, Eisenfelder landed the team assigned to Paris and began to prepare for a successful business venture in the small Lamar County city where he had never set foot. Charles W. Eisenfelder arrived in Paris with the energy of the 1900 storm, boasting he had purchased a boxcar load of baseball gear and interviewed several hundred ballplayers. He emphatically pointed out he would only sign the most upstanding, well-behaved candidates to contracts. In an age when most Texans seldom used the words “upstanding” and “well-behaved” when describing baseball players, Eisenfelder probably sealed his franchise’s fate on the spot. He stocked his team with little-known talent, with the possible exception of Paris native Rick Adams, one of few bright spots in an otherwise impotent lineup. But, when the “Parisians” won seven of their first nine games, local baseball fans thought Eisenfelder might just be the solution to the city’s failed franchises in its two previous Texas League seasons. The optimism soon evaporated, though, as the team followed its hot start by losing 12 of its next 14 games. To bolster attendance, Eisenfelder added an additional Paris native to his lineup, signing Ben Shelton after his former Sherman-Denison team relocated to Texarkana. Though Shelton brought a strong bat to town, it was not enough to offset the poor hitting and sloppy fielding of his teammates. As the season wore on, the Parisians continued to sink in the standings, barely managing to keep out of last place the majority of the summer. Sportswriters loved heckling the Parisians, and the daily jabs from the Dallas Morning News apparently ate at Charles Eisenfelder. As his team continued its swoon, he unilaterally announced he would relocate the franchise to Houston, an offense to both Paris fans and other Texas League owners who refused to approve a plan suggesting only one of the League’s cities in Southern Texas. Sportswriters piled on, substituting “Frenchmen” and “Frog Eaters” for “Parisians” on a regular basis. Unfortunately for Eisenfelder, his plan not only ruffled feathers among his fellow owners and sportswriters. Paris fan support disintegrated. Eisenfelder soon announced he could no longer afford to host home games, as he rapidly lost money after paying the visiting team’s $50 guarantee. With relocation already snubbed and a dissolved franchise not something the novice baseball executive wanted on his resume, Eisenfelder reached a decision bringing him fame among aficionados of baseball nicknames. Rather than risk losing money in Paris, Eisenfelder sent his Parisians on the road for most of the second half of the season. “Eisenfelder’s Homeseekers,” as the team became known, played only 15 of its final 56 games in Paris, predictably winning only 11 of its games on the road and finishing one game out of the Texas League cellar. But, Eisenfelder, not his opposing owners, consistently pocketed the coveted $50 guarantee. Following the 1902 season, both Paris and the Northern Circuit of the Texas League washed their hands of Charles Eisenfelder. He returned to Galveston and assisted in managing the affairs of the Sand Crabs for the first few weeks of the 1903 season before selling his share of a franchise which never returned to its 1899 championship form, a failure Eisenfelder’s must have considered vindication. Charles bounced in and out of local baseball circles for a few years, ultimately partnering with longtime Texas League umpire, ballplayer, and manager Wilson Matthews in purchasing the 1909 Charleston franchise of the South Atlantic League. Charles’ new venture may have taken him a thousand miles from Texas, but upon arriving in South Carolina, he immediately enraged his former colleagues, emphatically declaring South Atlantic League players as faster, more talented, and more disciplined than Texas Leaguers. He even went so far as to insult Texas League owners’ dedication to making baseball a respectable profession, noting the South Atlantic League demanded its players maintain a pristine public image and dress in fine clothes at all times. If in Texas, he added, the League’s ballplayers would easily be mistaken for bankers and businessmen. A San Antonio sportswriter answered Eisenfelder, pointing out his refusal to pay his former Texas League ballplayers salaries suitable to purchase decent suit of clothes as the reason he found the players on the East Coast so appealing. Midway through the season, though, Eisenfelder returned to Galveston as he and Wilson Matthews parted ways after repeatedly butting heads on team business matters. Once again, it seemed Charles Eisenfelder had overplayed his hand. Upon returning to the Galveston, Eisenfelder immediately gained the public spotlight his longstanding jealousy of the Moody’s, Kempner’s, and Sealy’s boiled over. He touted a plan to remove city politics from the influence of the wealthy families and took a leading role in forming Galveston’s Progressive Party, a group of Islanders determined to provide the average citizen a voice in civic affairs. Pressing for a representative local government and a city commission elected on a ward basis, Eisenfelder’s grandstanding undoubtedly did little to endear him to the powers who built Galveston. Likewise, his efforts failed and the three families continue to battle for control of Island politics. Professionally, Eisenfelder remained in a sporting business of sorts, becoming manager of the Surf Bathhouse. He advertised “The Surf Club” as an establishment for only the most reputable citizens of Galveston, attempting to appeal to the same class envy he had in promising Paris baseball fans he would sign only ballplayers local citizens would proudly support. The Surf Bathhouse, built over the water along Galveston’s newly-completed seawall, offered concerts, dancing, fishing, bathing, and boxing competitions for members only, with memberships set at $2 per year, or the bargain of $1 for six months. For a time the Surf Club succeeded, its distinctive architecture often pointed out as an example of Galveston’s sophistication and dedication to developing itself as a tourist center. Ultimately, the business proved no match for another of Galveston’s battles with Mother Nature. Its destruction in the 1915 hurricane led local leaders to consider prohibiting further construction beyond the seawall. Following the Surf Club’s demise, Eisenfelder continued searching for his niche, first setting up shop as the local distributor of Reif’s Special soft drink, a “near-beer” produced by a Tennessee company hailing its three month aging process—“By Golly, It’s Good!” With prohibition just a few years away and Galveston transforming into a “Free State” where law enforcement largely ignored liquor, gambling, and other vice-oriented businesses, the demand for near-beer on the island disappeared. At this point, Eisenfelder decided to enter full-time into a business he had dabbled in over the years—real estate management. The Galveston Daily News editions of the 1920’s and 1930’s are littered with his advertisements of rental property throughout the city. Even while suffering with congestive heart failure, Charles continued his effort to become a force on the Island, if only as a collector of overdue rent. In 1937, Charles W. Eisenfelder died following a stroke. Paulina, his wife of fifty years, sent his body to San Antonio for cremation, eventually burying his remains in Galveston’s Evergreen Cemetery. Even in death Eisenfelder must have been disappointed. The Moody, Sealy, and Kempner families, after all, owned burial plots in far more extravagant cemeteries on the island. Eisenfelder’s refusal to play home games in 1902 represented the beginning of the end of Texas League baseball in Paris. A year later, Ted Sullivan’s outstanding ball club bailed out of town at the season’s midpoint, and in 1904, two novice owners left their team in the League’s hands before the season came to a close. By 1905, with three consecutive Paris franchises failing to finish their seasons, Texas League owners no longer looked on the city as a viable location for a franchise. But, “Eisenfelder’s Homeseekers” keep Paris at least a footnote in Texas League lore over a century later. A.W. Neville’s intent in describing Charles W. Eisenfelder as “tall, gangly, and loose-jointed” will never be known. But, it’s doubtful Neville worried the frustrated businessman might dislocate his shoulder carrying a satchel of money to pay his ballplayers.